For letters, click where you want the merge code to appear. You will want the recipient’s name and address near the top of the document, just below the date. You might also want a greeting like (Dear name). You might want other personalization too, such as a mention of the person’s city or state in a body paragraph. For email messages, click where you want the first bit of personalization to appear. There isn’t a customary placement for personalized data in email messages like there is for a business letter. 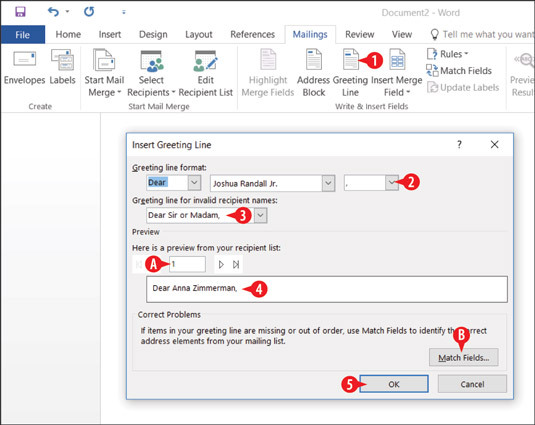 For envelopes, place the insertion point in the empty text box in the center of the label. For labels, place the insertion point in the upper right cell of the table. If you don’t see a table, choose Table Tools Layout →View Gridlines. For a directory, click where you want the merge code to appear. If you want some separator to appear between records, create that (such as a horizontal line or a blank line) and then move the insertion point above that separator. Until June 30, our store in Indianapolis is offering 20% off all clearance items. On the Mailings tab, click Address Block. Choose the format in which the person’s name should appear. If you do not want the company name (if any) to appear, click the Insert company name check box. Specify how addresses outside of the default country should be shown. Check the preview to make sure the address block appears as expected. If the address preview doesn’t look right, click Match Fields and use the dialog box that appears to match up the fields from the merge data file with the fields used for the address block. 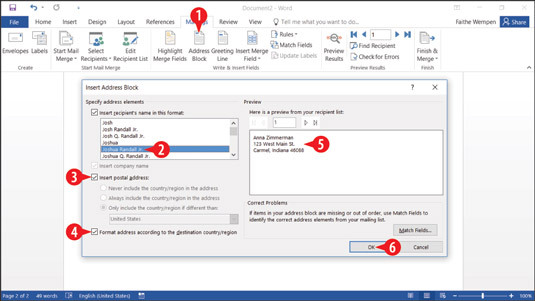 Specify options for the address block. The address block code appears in the document with double angle brackets around it, like this: <<AddressBlock>>. One problem with the default address block is that it leaves too much vertical space between lines, because of the default paragraph spacing. (Each line of the address block is a separate paragraph.) To see this for yourself, choose Mailings→Preview Results. Repeat that command to turn off the preview. On the Home tab, click the Line and Paragraph Spacing button to open its menu. Click Remove Space After Paragraph. Remove extra space after paragraphs within the address block. On the Mailings tab, click Greeting Line. Use the drop-down lists in the Greeting line format section to specify how the greeting will appear. Specify a greeting line for invalid recipient names (for example, a record where no recipient name was specified). Check the preview area to make sure the greeting line is as you want it. You can click the Next button to move through all the records to check each one. If the fields aren’t matching up, click Match Fields and specify which fields from the data list should be included in the greeting. Specify the settings for the greeting line. On the Mailings tab, click the arrow on the Insert Merge Field button, opening a menu. Click the desired field to insert. Choose an individual field to insert. Here’s an alternate method. You can click the face of the Insert Merge Field button (the graphical part, not the text and arrow below it) to open the Insert Merge Field dialog box. From there you can choose a field and click Insert.